Holy Spirit; Both now and ever, and unto the ages of ages. Amen. On October 7th Our Holy Orthodox Christian Church commemorates, honors and entreats the holy intercessions of the following Saints, Forefathers, Fathers, Patriarchs, Prophets, Preachers, Evangelists, Martyrs, Confessors, Ascetics, Teachers, and of every righteous soul made perfect in Our Holy Orthodox Christian faith: On the seventh of this month we commemorate the Holy Great Martyrs Sergius and Bacchus; Holy Martyrs Julian the Presbyter and Caesarius of Africa, the Deacon, Holy Martyrs Eusebius the Presbyter and Felix, who were beheaded; Saint Leontius the Consul; Holy Hieromartyr Polychronius, Priest of Nicaea; the Righteous Ninety-nine Holy Fathers; Holy Hieromartyr Polychronius, Bishop of Babylon in Persia, and those with him: Parmenius, Elymas, and Chrysotelos the Presbyters; Saints Luke and Mocius the Deacons; and Saints Abdon, Sennen, Maximus, Polytelius and Olympiades; Holy Virgin Martyr Justina of Padua; Righteous Father Sergius the Obedient of the Kiev Caves; Saint Sergius of Nurma, who dwelt in Vologda; Saint Joseph the Wonderworker of Khevi in Georgia; Holy New Hieromartyr Sergius, Bishop of Narva, who was slain by the atheists (communists) in the year 1930. +By the holy intercessions of Your Saints, Holy Martyrs, Holy Presbyters, Holy Fathers, Holy Mothers, Holy Hieromartyrs, Holy Virgins, Holy Deacons, O Christ our God, have mercy on us and save us. Amen. THE HOLY MARTYRS SERGIUS AND BACCHUS. These holy Martyrs were Romans of high rank in the service of the Emperor Maximian, to whom it was reported that they did not take part in the festivals of the idols. When he called them into his presence, they confessed their Faith in the one God. He had them arrayed in women's clothes and paraded through the streets in mockery. They were afterwards scourged, from which Saint Bacchus died. This was about the year 296 AD. 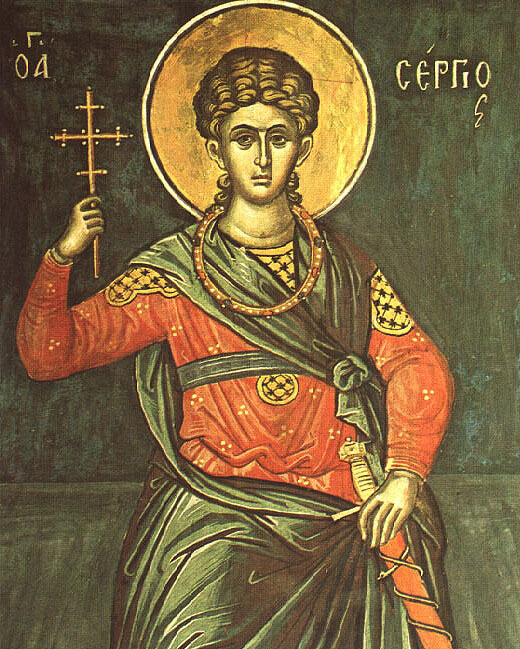 Saint Sergius was then taken to Resapha in Syria, where he was tortured and beheaded. His tomb in Resapha became a very famous shrine, to which pilgrims came from as far away as Western Europe; Resapha was later renamed Sergiopolis in his honor. As we gather, let us crown with sacred hymns of laudation those two brethren in the Faith, the great and valorous Martyrs: Sergius was the Triune Godhead's most steadfast warrior; and with him, wise Bacchus manfully suffered torments; and they both confessed Christ Savior as God, the Maker and sacred Trainer of all. "Judge not, and you shall not be judged. Condemn not, and you shall not be condemned. Forgive, and you will be forgiven. Give, and it will be given to you: good measure, pressed down, shaken together, and running over will be put into your bosom. For with the same measure that you use, it will be measured back to you. And He spoke a parable to them: Can the blind lead the blind? Will they not both fall into the ditch? A disciple is not above his teacher, but everyone who is perfectly trained will be like his teacher. And why do you look at the speck in your brother's eyes, but do not perceive the plank in your own eye? Or how can you say to your brother, 'Brother, let me remove the speck that is in your eye,' when you yourself do not see the plank that is in your own eye? Hypocrite! First remove the plank from your own eye, and then you will see clearly to remove the speck that is in your brother's eye. For a good tree does not bear bad fruit, nor does a bad tree bear good fruit. For every tree is known by its own fruit. For men do not gather figs from thorns, nor do they gather grapes form a bramble bush. A good man out of the good treasure of his heart brings forth good; and an evil man out of the evil treasure of his heart brings forth evil. For out of the abundance of the heart his mouth speaks." "And forgive us our trespasses as we forgive those who trespass against us." Oh, the unspeakable mercy of God! It has not merely given us a form of prayer and taught us how to act in a manner acceptable to him, uprooting both anger and sadness through the requirements of the formula that He gave, by which He ordered that we should always pray it. It has also conferred on those who pray an opportunity by disclosing to them the way that they may bring upon themselves the merciful and kind judgment of God, and it has conferred a certain power by which we can moderate the sentence of our Judge, persuading him to pardon our sins by the example of our own forgiveness, when we tell him: "Forgive us as we forgive." "And so, securely confident in this prayer, a person who has been forgiving to his own debtors and not to his Lord's will ask pardon for his offenses. For some of us--which is bad--are accustomed to show ourselves mild and very merciful with respect to things that are committed to God's disadvantage, although they may be great crimes, but to be very harsh and inexorable exactors with respect to the debts of even the slightest offenses committed against ourselves. Whoever, then, does not from his heart forgive the brother or sister who has offended him will, by this entreaty, be asking not for pardon but for condemnation for himself, and by his own say-so he will be requesting a harsher judgment for himself when he says: "Forgive me as I also have forgiven." And when he has been dealt with according to his own petition, what else will the consequence be that, following his own example, he will be punished with an implacable anger and an irremissible condemnation? Therefore, if we wish to be judged mercifully, we must ourselves be merciful toward those who have offended us. For we shall be forgiven to the degree that we have forgiven those who have injured us by any wrongdoing whatsoever. "Some people fear this, and when this prayer is recited together in church by the whole congregation they pass over this line in silence, lest by their own words they obligate rather than excuse themselves. They do not understand that it is in vain that they contrive to quibble in this way with the Judge of all, Who wished to show beforehand how He would judge His suppliants. For since He does not wish to be harsh and inexorable toward them, He indicated the form that His judgment would take. Thus, just as we want to be judged by Him, so also we should judge our brother and sister if they have offended us in anything, "because there is judgment without mercy for the one who has not acted mercifully." "Next there follows: "And subject us not to the trial." In this regard there arises a question of no small importance. For if we pray not to be allowed to be tried, how will the strength of our steadfastness be tested, according to the words: "Whoever has not been tried has not been proven?" And again: "Blessed is the man who undergoes trial?" Therefore, the words 'Subject us not to the trial' do not mean: Do not allow us ever to be tried, but rather: Do not allow us to be overcome when we are tried. For Job was tried, but he was not subjected to the trial. For he did not ascribe folly to God, nor did he as a blasphemer, with wicked tongue, accede to the will of the one trying him, to which he was being drawn. Abraham was tried and Joseph was tried, but neither of them was subjected to the trial, for neither of them consented to the one trying them. Ironically in our Hellenic cultural tradition one hears many times someone calling another person as "poneros" ("evil one") without understanding what they are saying or calling that person. Or, some people speak about the "the Greek poneria" or "Ελληνική πονηρία". In other words the evil way Greeks act. I don't believe that anyone would like to be called a devil or evil. There are those, however, that do act deliberately in a very cunning, devious, crafty or sly way in order to accomplish what they set out to do. They do use these deceptive ways and they believe that they are so much more clever or shrewd than others in order to go through with their plans. However, they do not realize how dangerous and damaging this is to their soul to use evil means, no matter how "good" or "noble" the cause may seem to be. "Τό κοινωνικό κακό, η εξαπάτηση των ανθρώπων από όσους ελεύθερα επιλέγουν να ζούνε αντίθετα του Θεού." The person who invokes the evil one to assist him/her to use evil means to accomplish his/her agenda instead of turning to God offends God and commits a great sin. A sin that must be confessed to the father confessor and most of all, to repent of it. The Christian believer does not ever need to use evil means to accomplish anything in his/her life. Christ reminds us, however, that, "No servant can serve two masters; for either he will hate the one and love the other, or else he will be loyal to the one and despise the other. You cannot serve God and mammon" (St. Luke 16:13). Ultimate loyalty cannot be divided. Our life as Christians must be a life devoted to God alone. No one but no one should consider himself or herself as "poneros" or "poneri" as wonderful. It only means that you are evil and sinister (i.e., "suggesting veiled evil or menace".) God has His way of exposing people like that.